That’s right. After a much longer than anticipated delay, Mixtape #2 is finally available for purchase at finer comic book stores everywhere. What’s changed is that we are no longer going to solicit Mixtape through Diamond Direct, opting instead to go through Comic Flea Market, Indy Planet, and some other options. This has been in the works for a while, but we wanted to make sure everything was sorted out before we made it official. The galley proof of Mixtape #2 arrived last week, some minor changes to it have been implemented, and it’s up for sale right now on Indy Planet, found here. Lookin’ gooood. Lookin’ real good. For me, the biggest concern has been that we get books to people who want them. Fact is not everyone has easy access to a comic book store. One Mixtape fan lives in Iqaluit, N.W.T., and you can imagine how difficult it is for them to get a copy of the book. 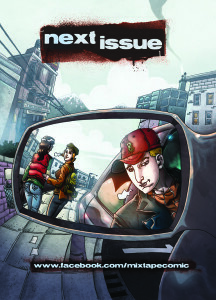 Another lives in Oslo, and it took him several months to track down a copy of #1. Plus, when people inevitably ask where they can get Mixtape #2, #3, #4 and so on like they did with #1, we can now point them in the direction best suited to their needs and location. So, Mixtape #2 is available now, with #3 dropping in a few months. We’re working on getting #1 reprinted so people who missed it can still get a copy, but there are still some available for purchase here. Mixtape will also be available as non DRM’d digital downloads for Nook, Kindle, iPad and all standard eReaders. You can download #1 now through Comics Plus. 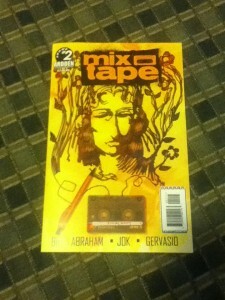 We’ve also priced Mixtape #2 slightly below cover as an added incentive for the stores. 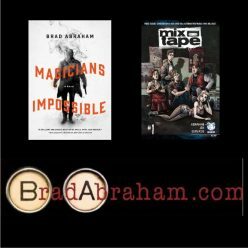 We’re big supporters of local retailers, and their ordering and stocking of Mixtape helps spread word that the book exists. I know for a fact a lot of Mixtape’s readers discovered the book simply by seeing it on the shelf, picking it up, flipping through it, and adding it to their armload of books for that week. Plus, comic book stores are one of the last places you can still get that ‘record store experience’ and we’d all hate to see the local comic shop go the way records stores did. We plan to get the remainder of Mixtape Vol. 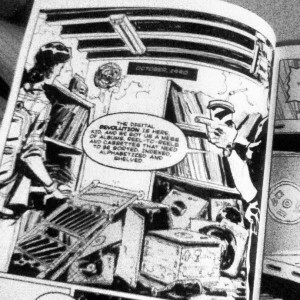 1 (a.k.a.”Left of the Dial”) out in 2013. Once that’s done, we’ll start work on Vol. 2 “Daydream Nation” which takes Jim, Lorelei, Terry, Noel, and Siobhan from the cloistered confines of Garrison Creek to the big bad world of college. I’ve already scripted the first two stories in that arc, with the other three plotted. The grand plan is for five, possibly six Mixtape arcs, and possibly a spin-off featuring further adventures of some seemingly minor characters, under the working title of “Cassingles”. So that’s where we stand. Getting Mixtape into stores in 2012 was a big challenge, but we feel this is the best way forward. You won’t see those big gaps between issues like you’ve seen so far. As more details and options to acquire Mixtape become available, we’ll post them on Twitter, Facebook, and here. So that’s it. Closing up shop here for the next couple weeks, but I’ll be back in January (assuming those Mayans were wrong about December 21st – in which case, nice knowing you). Over the Christmas break I plan to – well, keep writing, actually. Deadlines don’t take holidays. And again, Mixtape wouldn’t be the success it is without the readers and fans who’ve stuck with us through this entire saga. 2012 was the opening act. 2013 is the main event. *It’s since been pointed out the volume discount currently available through IndyPlanet is not quite the 50% discount comic book stores expect. We are working on getting that sorted and should have the info for that in January. Any comic shops interested in ordering books at a discount can contact me through mixtapecomic@gmail.com and when the details are set I can let you know. Thanks! I attempt to post a comment and let the author know. This is quality stuff and you must feel proud. Wish I had articles like this on my web site. Well done.